While the message of Christian Science is spreading quickly around the world, some areas don’t yet have access to a local church and congregation that meets their needs. If you are looking for a way to connect with a branch church, but don’t have one nearby, we invite you to be a part of our church online. 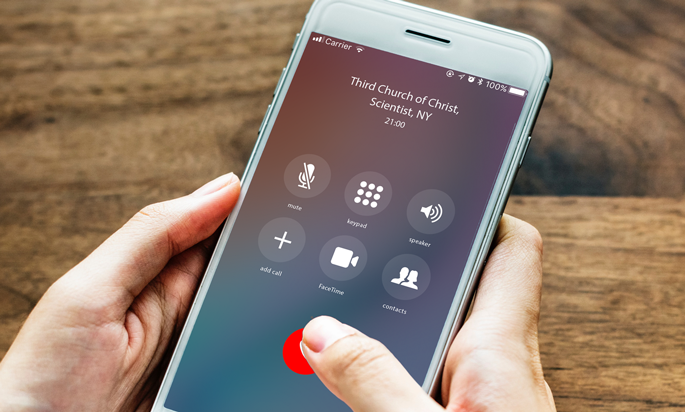 Our Sunday and Wednesday services can be accessed via conference phone or online, and remote listeners are able to share testimonies on Wednesday nights. Sunday School students can attend class with our teachers through Facebook or Google Hangouts. There are many ways that you can participate in the activity of our branch church from wherever you are! If you would like to give a testimony during a Wednesday evening meeting, press 5*. You will then be asked to confirm that you would like to speak by pressing 1. Press 1 and wait until the conference call service announces that your line is “un-muted,” then proceed with giving your testimony. When you are finished with your testimony, the moderator will re-mute your line. For Information on remotely attending our Sunday Services in Spanish click here. How can I watch Your Wednesday Testimony meetings? We don’t video stream the Wednesday Testimony Meetings but you can listen in with the number above! Thank you so very much for providing an opportunity for me to give a testimony over the phone. I reside in a remote part of Washington state. I will utilize theservice, hopefully tonight.